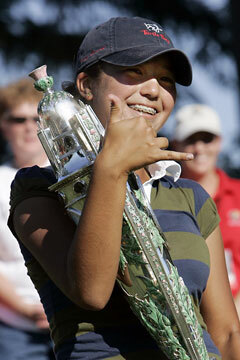 Hilo teen Kimberly Kim flashed a shaka yesterday as she held her trophy after winning the 106th U.S. Women's Amateur golf tournament in North Plains, Ore.
NORTH PLAINS, Ore. » For the most part, Kimberly Kim takes everything in stride, the way a well-adjusted 14-year-old does. But even her naivete has its limits. The Hilo girl finally seemed to understand the gravity of the situation as she stood over a 5-foot putt to win the U.S. Women's Amateur tournament at Pumpkin Ridge yesterday. "I was shaking so much," Kim said. "I don't even know where I aimed, or anything." Kim made the knee-knocker and became the youngest winner in the 111-year history of the tournament. She beat Katharina Schallenberg of Germany 1 up. Kim said last night she would wait to celebrate until her family is reunited. She and her father, Young Soo, who has traveled with her all summer, will join her mother and sister in Arizona this week for one more tournament. Kimberly and her mother live in Arizona now, for golf reasons. The father maintains the family home in Hilo, where he has an orchid farm. Things were not very rosy for Kim early yesterday. Schallenberg, a 26-year-old former bank clerk, went 5 up 15 holes into the 36-hole match. Kim ground her way back to 2 down at the midway point. At the break, caddie Frank Nau told Kim to stop worrying and start blasting away at the 6,380-yard, par-71 Witch Hollow Course. "We're going to play smash-mouth golf," Nau said. Kimberly Kim lifted her face to the sun yesterday after dropping a birdie putt on the 18th hole to win the 106th U.S. Women's Amateur golf tournament in Oregon. "I said, 'What's that?' He said, 'Just go for it,'" Kim said. "After eight holes we got to all square (with a birdie putt)." Kim went 2 up on the 31st hole with a par putt. Schallenberg made a birdie putt from off the green on the par-5 36th hole. That put the pressure on Kim to birdie for the victory. Schallenberg cried after failing to become the first German-born player to win a USGA event. "I lost, but it was OK because we both played good golf," she said. It was the first victory for Kim since a national junior tournament two years ago. Kim was runner-up in the Women's Amateur Public Links, losing in the final to Tiffany Joh, 6 and 5, earlier this summer. She was also the youngest player to make the cut at the U.S. Women's Open. "Usually when I get down, I get really upset with myself and just give up," she said. Kim defeated 15-year-old Lindy Duncan of Plantation, Fla., 1 up in Saturday's semifinals to make it to the final, while Schallenberg downed 21-year old Texan Stacy Lewis on the 19th hole. "I didn't know it was that big of a tournament until last night, when there was a commercial on the Golf Channel, and I thought, 'Wow, this is a big deal,'" she said. "I don't even watch golf." Before Kim, the youngest Amateur champion was Laura Baugh, who won it in 1971 at 16 years, two months and 21 days. Last year's Amateur was won by 17-year-old Morgan Pressel at the Ansley Golf Club's Settindown Creek course in Roswell, Ga.
Star-Bulletin reporter Dave Reardon, the Associated Press and Bloomberg News Service contributed to this report.